Due to various scheduling mishaps and vacations and whatnot, the August beer club never happened, and September ended up being a little on the delayed side. But we finally made it, and a good time was had by all. For the uninitiated, beer club is a gathering of like minded coworkers who get together for food and optional libations at a local BYOB. Tonight we hit up a regular Mexican establishment and had a rather good time. 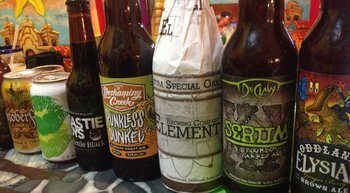 For the sake of posterity, tentative thoughts on each beer are below, though they should be taken with a grain of salt, since tastings like this are not exactly ideal conditions. So here we go, in order of drinking (not necessarily the order pictured). Pretty sure Neshaminy Creek got a cease and desist letter from a different brewery about their old name and that's why they changed it. I remember reading that somewhere but can't find it now. I'd love to try your barleywine if I ever have a chance to get out again. Love barleywines and don't mind low to none carbonation either! Also, you have an extra c after oak at the end of that entry. Apparently a brewery from Texas holds the trademark for "Punkel" and sent Neshaminy Creek a cease and desist. Go figure! I figured it had something to do with that, but Punkel Dunkel didn't seem like it would be that much of a problem. Oh well, it's still a great spin on your average, boring pumpkin beer. This page contains a single entry by Mark published on September 17, 2014 10:03 PM. Three Floyds Man-O-Awe was the previous entry in this blog. Foley Brothers Native IPA is the next entry in this blog.